What is a “moisture sandwich”? In a new e-book from The Construction Specifier, Ted Winslow of CertainTeed Insulation explains how tight-envelope construction techniques have led to a steep reduction in air movement through walls. This means moisture gets trapped inside wall cavities without sufficient means for it to escape, leading to reduced drying potential for a wall’s interior. This “moisture sandwich” is occurring with increasing frequency as architects incorporate newer insulation practices to enhance energy efficiency. Winslow goes on to say an average family of four can create two to three gallons of water vapor per day from cooking, bathing, dishes, and laundry. Over a heating season in colder climates, these moisture loads are driven toward a building’s exterior and penetrate into the wall cavity. By incorporating adaptable solutions like smart vapor retarders, occupant comfort can be managed and buildings set up for long-term structural success, he concludes. 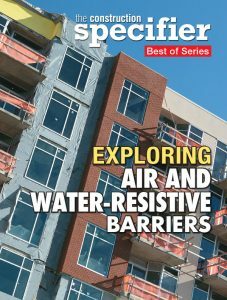 Winslow’s article, “Using vapor retarders to manage airflow and reduce moisture,” is part of the free, downloadable e-book “Exploring Air and Water-resistive Barriers.” This four-part, sponsored e-book takes an in-depth look at the building envelope, with a particular focus on managing air movement and moisture. Readers can learn about the use of building wraps as air barriers, and why airtight standards for energy efficiency have created new challenges for moisture management. Techniques for controlling air, vapor, and thermal transfer to help mitigate moisture problems within the building envelope are also discussed. In addition, the e-book covers trends found during the testing of tapes and flashings, particularly as they relate to adherence, durability, and the products’ ability to accommodate movement.